I was personally in attendance for this stage in 2004, on my first trip to Europe to ride my bike. It also happened to be one of OBT’s Tour de France tours! Fast forward 6 years, Joy and I took the reigns of OBT and now lead the TdF tours every year. This happens to be an article that Bruce Hildenbrand wrote for Cycle Sport on Andy Hampsten’s first American win on l’Alpe d’Huez, and the preview of the epic 2004 mountain Time Trial up Alpe d’Huez. For the results of the 2004 Alpe d’Huez Time Trial click here. To experience one of our Tour de France Vacation Packages, click the link. 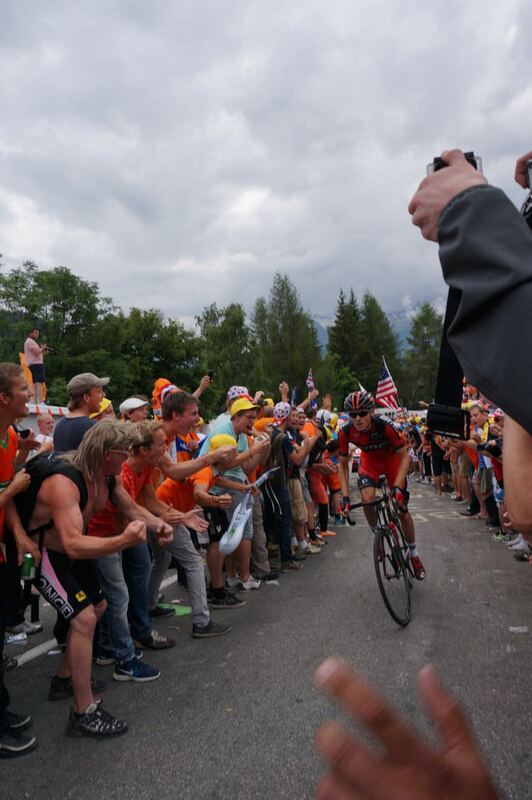 Want to see the Tour de France up close and in person!?! CLICK HERE and join us on our 2019 Tour de France tour! The dream of every climber is to win the Tour stage at Alpe d’Huez. It represents the unofficial climber’s championship and almost always plays a pivotal role in the overall outcome of the race. In 2003, Lance Armstrong’s margin of victory over Jan Ulrich was carved out on the storied slopes of the Alpe. With an individual time trial up it’s legendary 21-hairpin bends scheduled for the 2004 edition of the le Gran Boucle many believe this could be the most crucial test in Lance’s quest to become the first rider to win six Tours. And, to add even further drama, the race organizers have dedicated the 2004 stage to the memory of the late Marco Pantani, who tamed the slopes twice in 1995 and in 1997 when he set the unofficial record of 36 minutes for the 3,600-foot ascent. Lance has won here once before, in 2001, but he was preceded in that feat by another American, former Motorola teammate, Andy Hampsten. Hampsten’s Tour career hasn’t been as successful as his Texas teammate, but with two fourth place overall finishes he was clearly a contender and was capable of big things as he proved on Alpe d’Huez in 1992. But, the story of Andy’s incredible triumph really began the day before when the racers faced a stage of epic proportions, a 150-mile trek through the heart of the Alps crossing six major passes and amassing a mind-boggling 22,000 feet of climbing on the way to Sestriere. The wheat and the chaff went their separate ways on that legendary day and with four passes and 16,000 feet of climbing on the way to Alpe d’Huez the next day undoubtedly some of the wheat would become chaff! Luckily, the self-pity didn’t last long. “Even before I go my message and started relaxing I felt pretty good about the next day mostly because I made the key break on a huge day. I was thinking ‘its pretty steep after the village [on the second to last climb, Croix de Fer] maybe I will try to get into a good break there.’ Usually, my tactic was to wait until the final climb and try to take off but, I really wanted to win. I knew everyone was super tired. I knew to look for a good opportunity from a fair ways out,” remembers Hampsten. And, almost true to plan, things started happening on the third of the day’s four climbs. “Coming up the Croix de Fer the Banesto team [working for race leader Miguel Indurain] was doing a really hard tempo. We were probably down to maybe 30-40 riders. People just hanging on. It wasn’t like I was in big trouble but, it was a pretty serious tempo. And, an attack went. I thought ‘you know whoever attacks now is pretty strong because I am certainly feeling the climb and I know everyone else is.’ I was thinking ‘I wanted to attack, this could mess me up’ But, I thought ‘no, just watch’.